I love spending time in the kitchen but I love it even better when there’s someone with me to keep me company! Yesterday my oldest daughter (9) joined me to help me create some cupcakes. At her last Girl Scout meeting, she was chosen to bring snack for the next meeting. When I picked her up, she said “Guess what!! I get to bring snack next time! I want to bring cupcakes [my leader] says its ok!” 🙂 How can I say no to that enthusiasm? So we tossed around ideas and in the end I found some Thanksgiving themed cupcakes online. Perfect since it is 2 days before Thanksgiving! We had a blast making them and I encourage you to try them for your holiday gatherings or just to have a fun time with your kids. Mashed Potatoes [My favorite one of them!! ]: White icing, piped on with a 1A (large round) tip so that there was a “well” in the center of it. The “butter” is a yellow starburst that I cut in half. I put that in the center and the drizzled a bit of caramel ice cream topping over it. 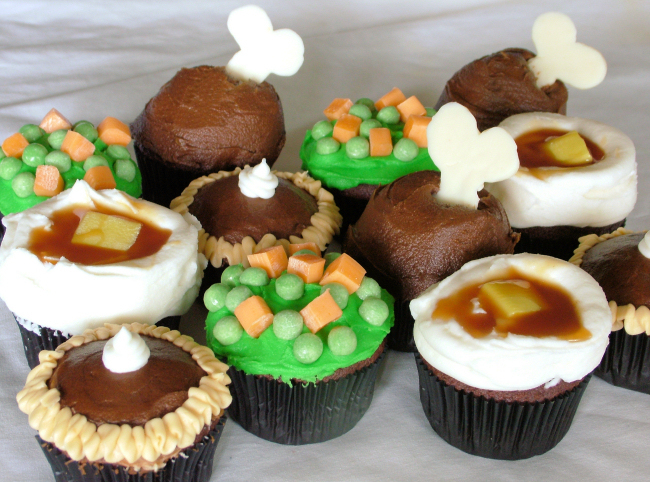 Peas & Carrots: Spread green icing over the cupcake. The “peas” were made from chewy mini sweet tart balls. You can also use the green runts for this. The “carrots” were orange starburst that I quartered. Drumstick: The “bones” I made up ahead of time by using white chocolate melts and a tip 8 to pipe into that basic shape on waxed paper. Allow to cool/harden and then pop them off. I used chocolate buttercream and another tip 1A to make a huge, slightly off center, mound of icing. Then stick the “bone” in the side of it. Chocolate Pie: First ice the “pie” color. My daughter loves chocolate pie so we used brown. But you can use an orange-ish/brown for pumpkin pie, red for cherry, etc. Then I used a small flat tip (like a smooth basket weave tip but not as wide) to pipe a basic “crust” around in ivory. Then I used a tip 3 top pipe white icing on top for “whipped cream”. If you make some, share your pics or send me a link to them.